Bartrop, Paul and Grimm, Eve. 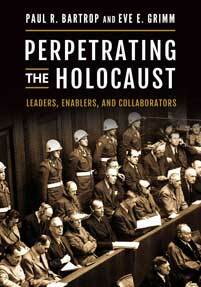 Perpetrating the Holocaust: Leaders, Enablers, and Collaborators. ABC-CLIO, 2019. ABC-CLIO, publisher.abc-clio.com/9781440858970. Weaving together a number of disparate themes relating to Holocaust perpetrators, this book shows how Nazi Germany propelled a vast number of Europeans to try to re-engineer the population base of the continent through mass murder.